Last September I was very lucky to have lunch with Philip Waddell and Roger Stevens when I went to the We Love Poetry exhibition that the fantastic Liz Brownlee had organised. I am delighted to bring to you more about Philip Waddell! Job: Househusband, handyman and poet. I’ll have a go at writing on any subject if requested but I like my poems to take a comic or surprising turn. I’ve written lots of poems featuring animals and monsters. 2) Who are your main influences? When I started writing my main influences were the likes of Ogden Nash, Shel Silverstein, Dorothy Parker, Colin McNaughton and Roger Mc Gough. Nowadays there are many more. 3) How do you get your ideas? And his other half’s now known as Rick. But mostly I just make the decision to write and see where it takes me. 4) How do you set about writing a poem? If I’m trying to write on a subject requested I’d usually spend about three days jotting down any ideas that come in the hope of finding an original angle. After about three days, with any luck, I find that one idea will lead to another. I find that my poems choose their own form and rhythm once I start writing. The hardest thing for me is knowing when a poem is finished and I’m inclined to go on altering poems sometimes long after they’ve been published, which makes it very difficult for me to memorise my own work! 5) What things do you like to read? These days I mainly read poetry, both adult and children’s, and picture books – in the hope of being inspired to write one! But when I’m on holiday I enjoy novels (often comic) or books by scientist authors like Steve Jones, Robert Winston, Richard Dawkins etc. 6) Where can we read your work? Since 1997 my poems have appeared in more than 80 anthologies, many from Macmillan. Most recently in Read Me Out Loud, edited by Nick Toczek and Paul Cookson; The Jumble Book, Edited by Roger Stevens; Read Me At School, Edited by Gaby Morgan; Shouting At The Ocean, Edited by Denton, Shavick and Stevens and My Cat is in Love with the Goldfish, Edited by Graham Denton. 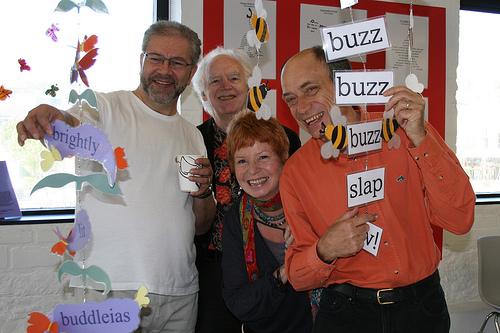 With poet Ian Bland I recently co-wrote and illustrated A Bug in my Hair! Poems for children aged 5 – 7. 7) Have you any plans for your poetry? By the end of 2010 Ian and I are planning to have completed another collection of our poems for children aged 7 – 11. I also hope to have set up my own dazzlingly beautiful and utterly beguiling poetry website by then. The oldest anthology in my collection of poetry books is The Oxford Book of English Verse (1250 – 1918), which I was awarded on prize day 1965 ‘for English’ so I’ve long enjoyed poetry! But the thing that finally inspired me to try my own hand at writing poetry was a couplet by Anon from a 1986 collection, Is A Caterpillar Ticklish? None’ll come, and then a lot’ll. Brilliant Philip thanks! And I am so looking forward to seeing your website and your next anthology with Ian. Keep up the good work! they’re wild, screaming and running amok! but I can’t find them anywhere! I frantically phoned my friend Jan.
lamented Jan with a sigh, “so no help at all. “Goggle Google,” suggested Roger, ever helpful. proved a complete waste of time. In desperation, I tried Celia. or no use at all for your lot. then xchnge them fr nu 1s! for a moment seemed extremely tempting! But then my moment of genius! I grabbed the remote, aimed it at the TV and stabbed ON. It was as if they’d been dropped by sonic screwdrivers. Closing the door behind me I whispered my gratitude. Good to learn more about Philip. He didn’t mention in his interview though his giant size (about seven foot three). I also noticd he said he was twelve. This is quite clearly not true. I think you should check those sort of facts, Karen, before writing them in a blog like this. So Roger when’s your interview? Mum says something about letting Katy, Alex and Fred interview you sometime in May? Mum says Phil paid her good money not to edit his interview! Great and love the comments too haha! philip currently has a dose of dragonitus – bit worried about him. I think his case of dragon flu is turning him into one!